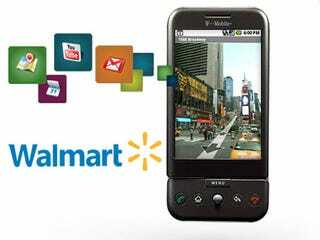 Whoa, as of tomorrow, Walmart will be the best place to buy the T-Mobile G1—or at the least the cheapest. Dow Jones reports that over 550 Walmart stores will start selling the G1 tomorrow for $148.88 to new T-Mo customers, or ones eligible for an upgrade, with the usual two-year blood contract. (Aside: Does anyone else hate Walmart's infatuation with eights?) No details on where these 550 stores might be—but at least a few should be outside of T-Mobile's magical 3Google zone, since some big cities, like NY, don't really feel the Wally World mojo. But this means that you can soon shop for beef jerky in bulk and just maybe fondle an iPhone 3G and G1 under one industrial roof. Incredible. [CNN Money, Thanks Jack!